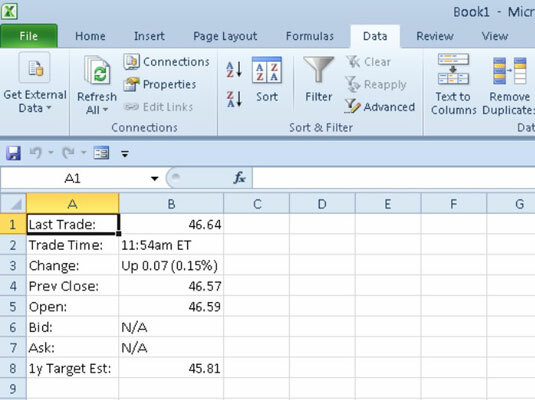 In Excel 2010, you can use Web queries to import data directly from various Web pages that contain financial and other types of statistical data that you need to work with in a worksheet. 1Click the From Web button in the Get External Data group on the Data tab. 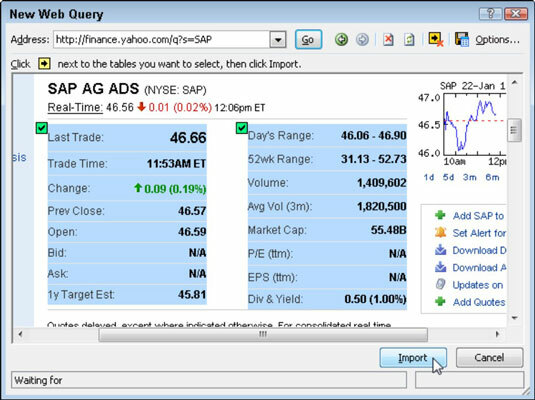 Excel opens the New Web Query dialog box containing the Home page for your computer’s default Web browser. 2To select the Web page containing the data you want to import into Excel, you can do either of the following. Either type the URL in the Address text box at the top of the New Web Query dialog box and click the Go button, or use the Search feature to find the Web page containing the data you wish to import. 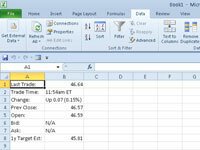 Excel indicates which tables of information you can import by using a yellow box with an arrowhead pointing right. 3Click the yellow box next to each of the tables you want to import. When you click a yellow box, it changes to a green box with a checkmark. 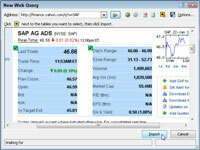 Excel closes the New Web Query dialog box and then opens the Import Data dialog box. 5Select to place the data in the Existing Worksheet or in a New Worksheet, and then click OK.
Excel closes the dialog box and then imports all the tables you selected on the Web page in the New Web Query dialog box.